Should the NFL have to pay former players for concussions? Will Zach Parise join the newly crowned Kings? Yesterday we started our summer long journey to count down the MTB College Sports Bucket List. It's our attempt to give you the Top 100 games, rivalries, and events that every college sports fan should witness at least once in their lives. In case you missed it yesterday, here's No. 100 on the list. But let's move things forward a bit, even if we're staying in the world of Hockey. We've found another unpolished gem of a rivalry for you, so without further delay.... Here's the next on the list!! Yep, we've gone under the radar with our pick for No. 99 on the MTB College Sports Bucket List once again. Adrian College is a small private university that has about 1,500 students located in Adrian, Michigan. MSOE stands for Milwaukee School of Engineering and has about 2,600 students located in the middle of downtown Milwaukee, Wisconsin. Really the make up of the schools and locations couldn't be much different and that helps kick start this as a must see game. 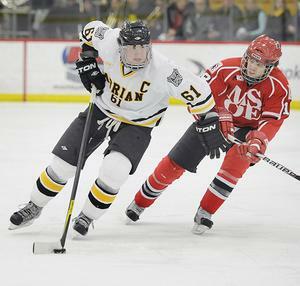 They both reside in the Midwest Collegiate Hockey Association (MCHA) that is made up of schools in Wisconsin and Michigan and is an up and coming league at the DIII level. What makes these two teams worth watching? Well, until Adrian came into the conference MSOE had one heck of a run going in the MCHA and was one of the better programs in the Midwest. Problem was once Adrian came on board there was a new top dog (pun unintended). Adrian had won the first 18 meetings going into this past season, but finally the Raiders of MSOE broke through in the win column. They actually took the season series with a 2-1-1 record and even took home the MCHA Harris Cup for the first time since Adrian joined the league to earn the automatic birth in the NCAA DIII tournament for 2012. Don't let the unbeaten streak of 18 games fool you though, these two teams always are competitive and it's usually a battle between 1st and 2nd place, something that always helps a rivalry develop for sure. The Raiders and Bulldogs just plain don't like each other much either, so that helps. These two meet at least four times a year and more than most likely it's 5 or 6 if you include the playoffs. While it may not have the deep rooted history of some classic rivals at the DIII level what more can you ask for than hatred, respect, competitive games, and playing at the top of your conference year in and year out to make it a game you must see? Add in the fact that they both play in great intimate hockey venues and you've got yourself one of the games you must see if you want to call yourself a true fan of college sports. Have to wonder how uncertainty over Miami's NCAA sanctions help the #Badgers chances to land some top FL talent.